Back in my first post of 2012, I mentioned that there would be lots of chamber music this semester. 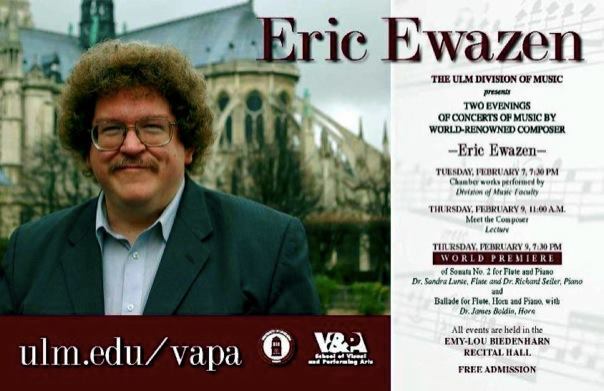 Things will kick off this week with two concerts featuring the music of Eric Ewazen. We will also be fortunate to have the composer on our campus for most of the week giving lectures, coaching rehearsals, and otherwise interacting with our faculty and students. Though he has written in a variety of genres, Ewazen is probably most well known for his solo and chamber music for winds and brass. He has a number of very fine works with horn, including a Sonata for Horn and Piano (1992) and a Concerto for Horn and Orchestra (2002). One big highlight of the week will be the world premier of his newly written Sonata No. 2 for Flute and Piano, commissioned by my colleagues Dr. Sandra Lunte and Dr. Richard Seiler. A special thank you goes out to them for organizing Dr. Ewazen’s visit! I’ll be joining my colleagues on that concert for a performance of the Ballade, Pastorale and Dance for Flute, Horn and Piano (2002). It’s a fun piece, but also a very substantial work with plenty of great writing for all three instruments. If you aren’t familiar with Ewazen’s music, it is generally very accessible and rewarding to perform. Quoting from the information on his website, here’s an annotated list of Eric Ewazen’s compositions with horn. By the way, if you happen to be in the area this week we’d love to see you at one or both of these concerts! For more details on the performances click here. “Concerto for Horn and Piano”, (Commissioned by Greg Hustis of the Dallas Symphony, this is an arrangement of the orginal work with String Orchestra accompaniment.) Nov., 2002, 20’(Ewazen). “Trio for Bassoon, Horn and Piano”, (for Toni Lipton and Scott Temple), 1983, 18′(Ewazen). I’m jealous. I love Ewazen’s music and would really enjoy picking his brain about composition. Thanks for reading! I had a chance to meet Ewazen yesterday – he’s charming and very down to earth!